U.S. photographer and filmmaker Man Ray (pictured here in 1934) was part of the Dadaist "cinema pur" film movement, which influenced the development of art film. The term was first coined by Henri Chomette. The goal of the movement was to create a cinema that focused on the pure elements of film like motion, visual composition, and rhythm. 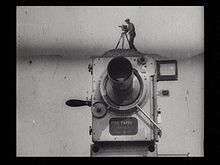 It was begun by European filmmakers René Clair, Fernand Léger, Hans Richter, Viking Eggeling and others. They sought to accomplish their goal by minimizing story and plot, focusing instead on visual concerns by using close-ups, dolly shots, montage, lens distortions, and other cinematic techniques. Films like Ballet Mécanique, Symphony Diagonale, and The Symphony of a Great City projected rhythm and motion in the title of the films and the works themselves. In addition to close-ups, other filmmaking techniques were used to create rhythm and visual interest. They include fast and slow motion, trick shots, stop-action cinematography and dynamic cutting. The clearest examples of pure cinema are said by essayist and filmmaker Hubert Revol to be documentaries. Documentary must be made by poets. Few of those within French cinema have understood that in our country, we possess innumerable elements and subjects to make, not just insignificant ribbons (of film), but splendid films lively and expressive... 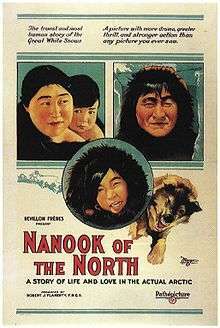 The purest demonstration of pure cinema, that is to say of poetry which is truly cinematographic, has been provided us by some remarkable films, vulgarly called documentaries, particularly Nanook and Moana. The Dadaists saw in film an opportunity to transcend "story", to ridicule "character," "setting," and "plot" as bourgeois conventions, to slaughter causality by using the innate dynamism of the film medium to overturn conventional Aristotelian notions of time and space. The movement also encompasses the work of the feminist critic/filmmaker Germaine Dulac, particularly Thème et variations, Disque 957, and Cinegraphic Study of an Arabesque. In these as well as in her theoretical writing, Dulac's goal was "pure" cinema, free from any influence from literature, the stage, or even the other visual arts. It declares cinema to be its own independent art form that should not borrow from literature or stage. As such, "pure cinema" is made up of nonstory, noncharacter films that convey abstract emotional experiences through unique cinematic devices such as montage (the Kuleshov Effect), camera movement and camera angles, sound-visual relationships, super-impositions and other optical effects, and visual composition. Critics and artists used terms such as Absolute Film, Pure Cinema, and Integral Cinema — Dulac's term which might better be translated "Self-Sufficient" or "Complete" cinema — to stress that these works, all of them, functioned only as cinema art: that they could not exist in any other medium because their essential effect arose from the unique potentials of the cinematic mechanism, such as flexible montage of time and space, measured pacing and control of gaze, exact repetition, single-frame diversity and continuity, superimposition and its related split-screen imagery. Cinéma Pur, a 1920s and 1930s French avant-garde film movement also influenced the development of the idea of "art film." 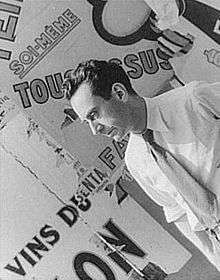 The cinema pur film movement included Dada artists, such as Man Ray (Emak-Bakia, Return to Reason), René Clair (Entr'acte), and Marcel Duchamp (Anemic Cinema). The Dadaists used film to transcend narrative (storytelling) conventions, bourgeois traditions, and conventional Aristotelian notions of time and space by creating a flexible montage of time and space. Chomette adjusts the film speed and shoots from different angles to capture abstract patterns in his 1925 film Jeux des reflets de la vitesse (The Play of Reflections and Speed). His film made the following year, Cinq minutes du cinéma pur (Five minutes of Pure Cinema) reflected a more minimal, formal style. Germaine Dulac's goal of "pure cinema" and some of her works inspired the French Cinema pur film movement. Theme et varitions (Theme and Variations) and Disque, both made in 1928, are two examples of cinéma pur by Dulac. Man Ray directed a number of influential avant-garde short films, known as Cinéma Pur. He directed Le Retour à la Raison (2 mins, 1923); Emak-Bakia (16 mins, 1926); L'Étoile de Mer (15 mins, 1928); and Les Mystères du Château de Dé (27 mins, 1929). Man Ray also assisted Marcel Duchamp with the cinematography of his film Anemic Cinema (1926), and Ray personally manned the camera on Fernand Léger's Ballet Mécanique (1924). Director George Lucas, as a teenager in San Francisco during the early 1960s, saw many exhilarating and inspiring abstract 16mm movies and nonstory noncharacter 16mm visual tone poems screened at cinematic artist Bruce Baillie's independent, underground Canyon Cinema shows; along with some of Baillie's own early visual motion pictures, Lucas became inspired by the work of Jordan Belson, Bruce Conner, Will Hindle, and others. Lucas then went on to enroll as a film student at USC School of Cinematic Arts, where he saw many more inspiring cinematic works in class, particularly the visual movies coming out of the National Film Board of Canada like Arthur Lipsett's 21-87, the French-Canadian cameraman Jean-Claude Labrecque's cinéma vérité 60 Cycles, the work of Norman McLaren, and the visualist cinéma vérité documentaries of Claude Jutra. Lipsett's 21-87, a 1963 Canadian short abstract collage film of discarded footage and city street scenes, had a profound influence on Lucas and sound designer/editor Walter Murch. Lucas greatly admired pure cinema and at film school became prolific at making 16 mm nonstory noncharacter visual tone poems and cinéma vérité, with such titles as Look at Life, Herbie, 1:42.08, The Emperor, Anyone Lived in a Pretty (how) Town, Filmmaker, and 6-18-67. Lucas's aesthetic and style was also strongly influenced for the Star Wars films. Lucas tributes to 21-87 appear in several places in Star Wars, with the phrase, "The Force", said to have been inspired by 21-87. Lucas was passionate and interested in camerawork and editing, defining himself as a filmmaker as opposed to being a director, and he loved making abstract visual movies that create emotions purely through cinema. Patrick Bokanowski's 1982 film The Angel is said to have realized what some artists-filmmakers envisioned in the 1920s: an aesthetic for creations to come – the Cinéma pur and the first avant-garde. This is a partial list of examples of Cinéma pur or Pure Cinema. For more examples, see the Cinéma pur / Pure Cinema template below. Viking Eggeling, Symphonie diagonale, 1924. Pictures are brought to life with rhythm and motion in this film. ^ Cite error: The named reference books.google.com was invoked but never defined (see the help page). ↑ Frank Eugene Beaver. Dictionary of Film Terms: The Aesthetic Companion To Film Art. Peter Lang; 2006 [cited 13 September 2012]. ISBN 978-0-8204-7298-0. p. 23. ↑ Frank Eugene Beaver. Dictionary of Film Terms: The Aesthetic Companion To Film Art. Peter Lang; 2006 [cited 13 September 2012]. ISBN 978-0-8204-7298-0. pp. 23-24, 39. 1 2 Ian Aitken. European Film Theory and Cinema: A Critical Introduction. Indiana University Press; 1 January 2002 [cited 14 September 2012]. ISBN 978-0-253-34043-6. p. 72. 1 2 Frank Eugene Beaver. Dictionary of Film Terms: The Aesthetic Companion To Film Art. Peter Lang; 2006 [cited 13 September 2012]. ISBN 978-0-8204-7298-0. p. 23-24, 39-40, 90. ↑ Tami Michelle Williams. Beyond Impressions: The Life and Films of Germaine Dulac from Aesthetics to Politics. ProQuest; 2007 [cited 13 September 2012]. ISBN 978-0-549-44079-6. p. 7. 1 2 Ian Aitken. European Film Theory and Cinema: A Critical Introduction. Indiana University Press; 1 January 2002 [cited 14 September 2012]. ISBN 978-0-253-34043-6. p. 80. ↑ Pollock, Dale (1983). Skywalking: The Life and Films of George Lucas. London: Elm Tree Books. ISBN 0-241-11034-3. ↑ Steve Silberman. Life After Darth. George Lucas interview. Wired. May 2005. Retrieved September 13, 2012. ↑ Dan Brown. Star Wars: the Canadian angle. CBC News Online. September 8, 2004. Retrieved September 13, 2012. Charles Price Ford. Germaine Dulac : 1882 - 1942 Avant-scene du Cinema, 1968. Konigsberg, Ira (1998). The Complete Film Dictionary. Penguin Group (USA) Incorporated. ISBN 978-0-14-051393-6. Dr. William Moritz. Abstract Films of the 1920. International Experimental Film Congress, 1989. Vorkapić, Slavko (1998). O pravom filmu. Fakultet dramskih umetnosti. Vsevolod Illarionovich Pudovkin (1958). Film technique: and Film acting. Vision press.